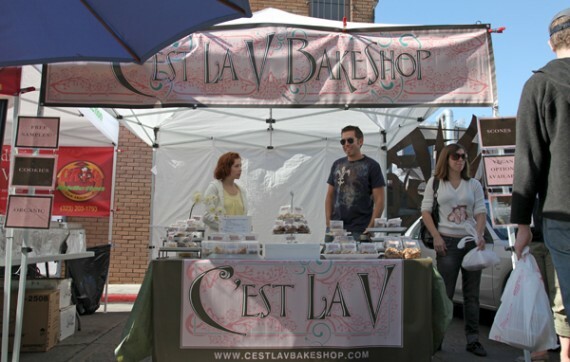 since you will probably already be up on sunday morning to buy the best breakfast sandwich in the world at the hollywood farmers market, while you are there be sure to head over to cosmo street for some vegan baked goods from the c’est la v booth. 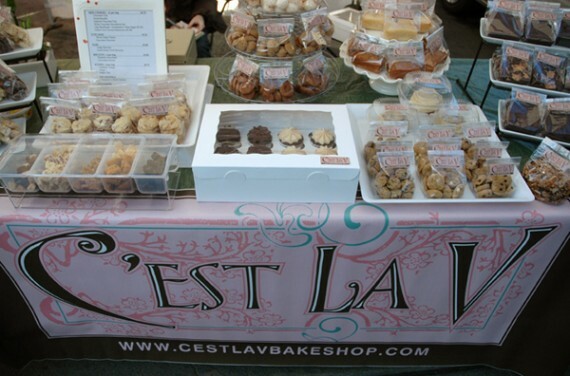 created by kim garr, one LA’s most popular vegan bakers, c’est la v specializes in treats that taste just like traditional decadent baked goods…but with no refined sugar or animal products. 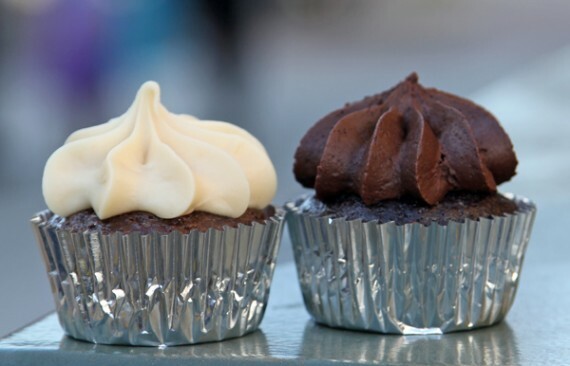 c’est la v has been offering their amazing animal-free desserts at the hollywood farmers market for a while, but now that the weather has cooled down a bit, they have finally started selling the most beloved vegan treat ever—cupcakes! 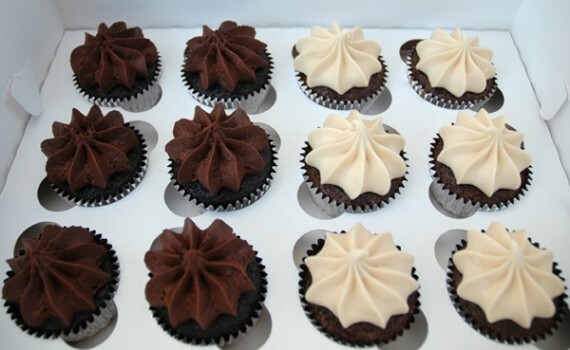 and these aren’t just any old vegan cupcakes, these are seriously some of the best. do you guys remember leda’s bakeshop in sherman oaks? they shut down a while ago, but back in the day they used to have the most delicious cupcakes in town—seriously worth a drive to the valley for. 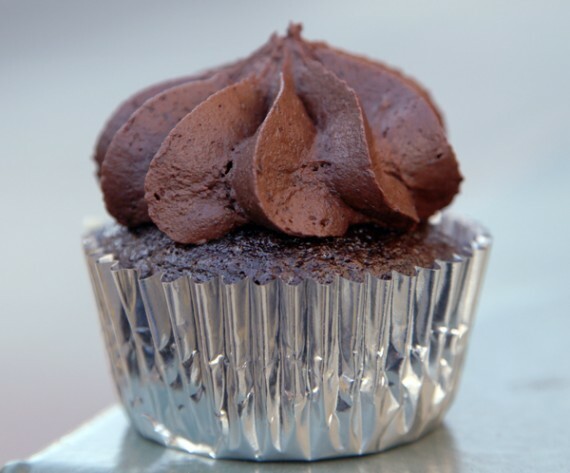 well kim garr was the original vegan baker at leda’s, so the fact that her vegan cupcakes are available to the public once again is quite a big deal! last sunday when i dropped by the c’est la v booth, they were selling 2 flavors of cupcakes—chocolate chocolate and velvet with cream cheese. both of them were excellent. 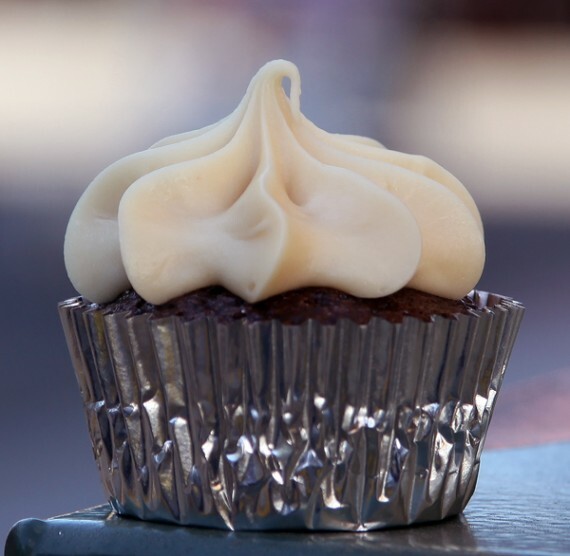 the velvet one was moist and delicious, topped with a dollop of incredibly rich vegan cream cheese frosting. it was basically like a red velvet cupcake but without the food coloring, so if you are a RV fan, you will LOVE this. and the chocolate chocolate…wow! this flavor was my personal favorite. i am a huge chocolate fan, and this thing did not disappoint—the cake was packed with amazing sweet flavor, and the frosting was so fluffy. i’m glad i was pretty far away from the c’est la v booth when i started eating it, because i would not have been able to resist going back for more. whatever your plans are on sunday, you should figure out a way to work in a trip to the hollywood farmers market and pay c’est la v a visit. sure, you can always order their stuff online…but you usually have to order like 12 cupcakes at a time. here you can go grab as many things as you want, and try a variety of their goods! i know i will be back again on sunday. kim and ryan are the bee’s knees! the peanut butter brownies are soooo good! i was there last weekend and tried the cinnamon bun. it was delicious! C’est La V is the BEST!! Definitely worth checking out. I love the oatmeal cranberry cookies and the scones! These cupcakes look so good. I hope I get out to LA sometime so I can taste all this stuff you blog about! I haven’t tried Kim’s cupcakes yet! I never did make it to Leda’s before it closed, so I’ll be looking forward to this treat. Kim and Ryan are awesome, too! I’m going to miss this so much when I move back to Texas 🙁 It’s nice to be able to pick up vegan baked goods instead of having to make them anytime the craving strikes. Kim is the sweetest! I hope I get a chance to check out her full booth of goodies sometime. Is this farmer’s market every sunday, or only certain times of the year? And they’re there each sunday?